Say what you will about Lady Gaga, her style choice, personality, and whatever else you find to say about her. But one thing you can’t say is that she isn’t popular, especially on YouTube. 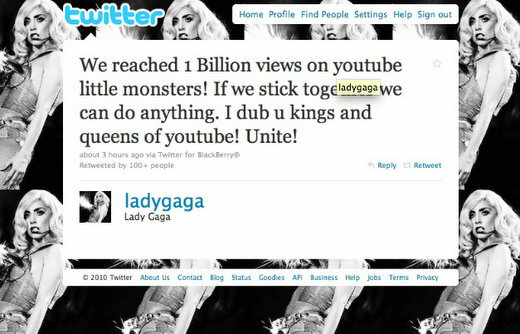 Today, Lada Gaga announced to her fans via Twitter that her videos on YouTube have reached 1 billion views. What’s so great about Lada Gaga’s videos hitting 1 billion views on YouTube? Well… she’s the first person to achieve this level of viewers as an individual. Justin Bieber is the only person is even close with 962,726,797 total video views.